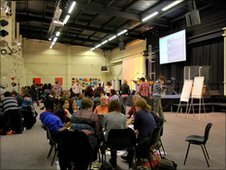 Leaders from the Church of England have gathered in Sheffield to meet over 150 young people. The Bishop of Sheffield, Right Reverend Dr Steven Croft attended the event at St Thomas' Church in Hillsborough alongside Archbishop of Canterbury, Rowan Williams and the Archbishop of York, John Sentaumo. The event, called 'Regeneration' was a summit led by young people aged between 15 and 21-years-old, giving them an opportunity to talk about how young people feature in the churches agenda. "Iit is really important that the leadership of the church listen to young people face to face about the pressures and issues that their generation are facing. "We've been doing a lot of work about the assumptions people bring to the church, what people think when they hear the word and what people expect when they come through the door -the positives and the negatives." Archbishop Williams added: "I really hope that we can bring something really constructive from this. I really believe that it is worth putting a lot of energy into this and I hope that it can be done. I am committed to trying."